Wheeler Creative Studios' mission is to develop advertising strategies and distribute great advertising content for clients in healthcare and education, and anyone else who sees the value of creativity, frequency and impact. We specialize in radio, print, digital, outdoor and television. Whatever your budget we can help you design a powerful and creative campaign and create a plan to make sure your campaign reaches as many people as possible. 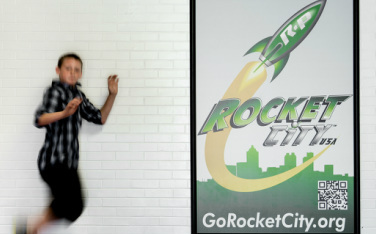 Our expertise in marketing schools, like the comprehensive Go Rocket City campaign for Reeths-Puffer Schools, has been successful in raising student enrollment, promoting post secondary education plans and building a community around a school system. We have experience with public schools, universities and grant funded educational programs. With more than 250 national and international healthcare advertising awards, Wheeler Creative Studios delivers expert healthcare advertising campaigns in radio, print, outdoor and video and optimizes the media placement and planning for frequency and reach. "Tim Wheeler's 'ear' for detail not only raised public awareness of our festival through timely radio spots, but I was thrilled by the originality and creativity of the work itself. We simply can't thank him enough for all of his help." "Tim's ability to create pieces that demonstrate both a sense of caring and concern are what makes him unique. He truly listens to the customer before attempting to create. His talent allows him to mix humor with seriousness, and create a dramatic advertising piece. We couldn’t have been more pleased with Tim’s work. According to the Radio Advertising Bureau, 93% of the US population listens to the radio. With numbers like that it's easy to see that radio can give you the biggest bang for your advertising dollar. Need to know more about Wheeler Creative Studios' experience with radio? We've won over 250 national and international awards for radio advertising. We have happy clients with measurable volume growth. We have happy clients with market share increase. We have happy clients with peace of mind knowing they have found an experienced and creative partner to help them get the most out of their advertising endeavors. You can advertise on the radio with any budget. Great creative, professional production and strategic placement can take your business to the next level. And Wheeler Creative Studios offers even more than great (award-winning) creative, professional production and strategic placement. We offer digital marketing to supplement your radio placement; value added sponsorship opportunities and on-air interviews; an hour-long, weekly radio show; plus comprehensive performance reports that are easy to understand.